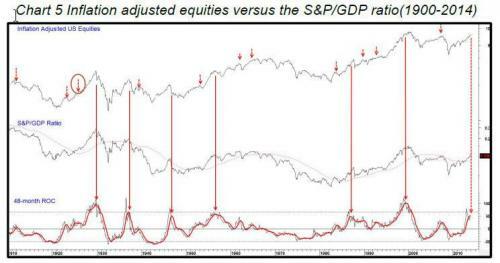 Just astounded at market action, haven't seen so many of these patterns since 99-2000. Should find support here at apex for a while often a bounce then down again. 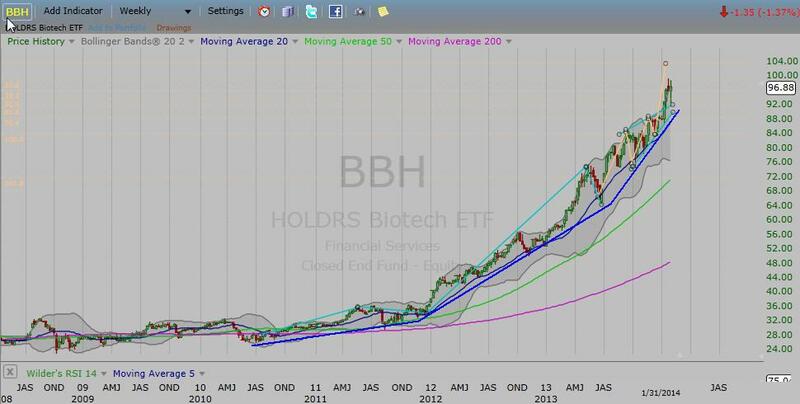 RTH is Retail Holders ETF and on my short watch list looking for good set ups on the way down. 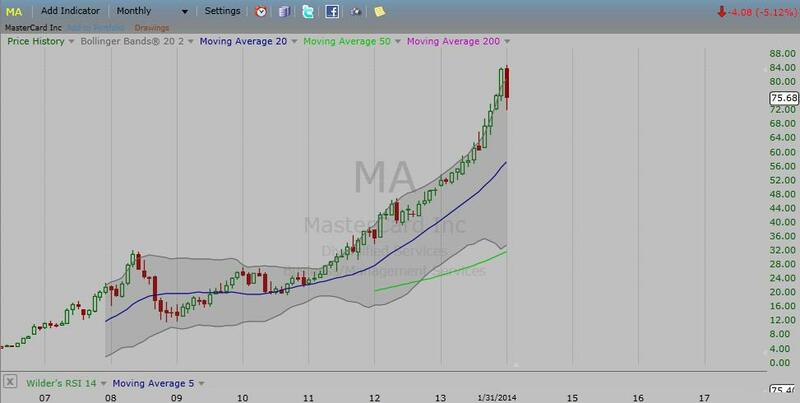 Bear finally catches up with engulfing candlestick! Watching this closely next week to trade short! Final push a bit higher projected to meet Wave 1 price equivalency at some point, March?? 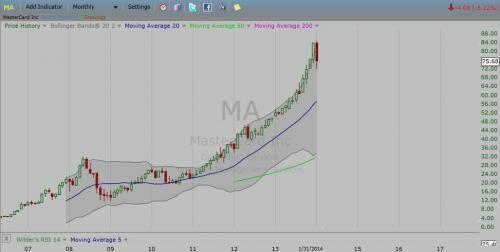 Look at the chart I posted of Retailers to see same pattern that has already blew out and back down to the apex. 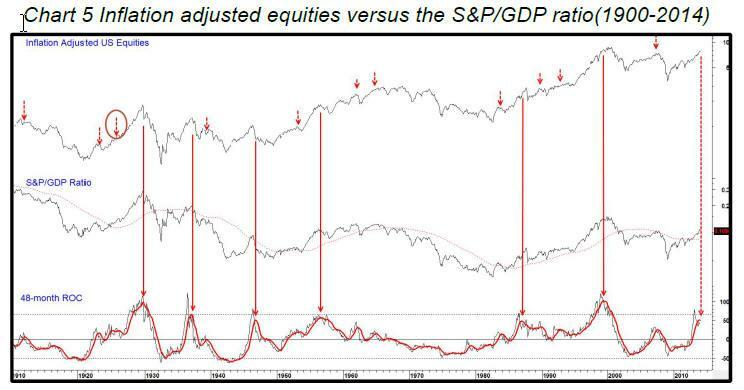 Going to be a dramatic reversal! FTSE Another textbook EW structure; its all there folks, wish things were always this well defined. the extremely impulsive a and b in this flat. That's what I Iook for when sniffing out b waves in flats and zig zags. C wave now equal to A wave price wise. C wave has perfect embedded 5 wave. Final wave is forming an mutated diagonal. 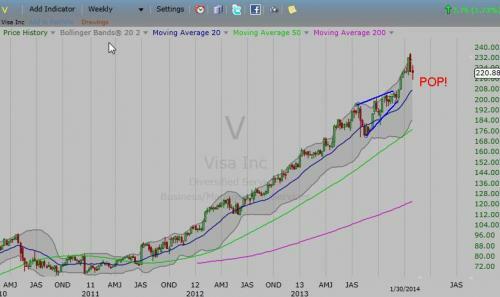 Watch the thick blue 2-4 trendline when that goes its gonna drop. A pullback to the trendline would then provide low risk shorting opportunity. 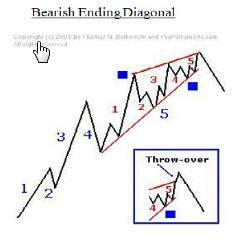 Many charts have big triangles (and diametrics) for corrective structure during this time period but this is a bit unusual wave a is very small and wave b very large going way up to new highs! I have seen this before although not quite to this extreme. Wave C has reached equivalency with Wave A but just look at this crazy Wave C, holy gapola! 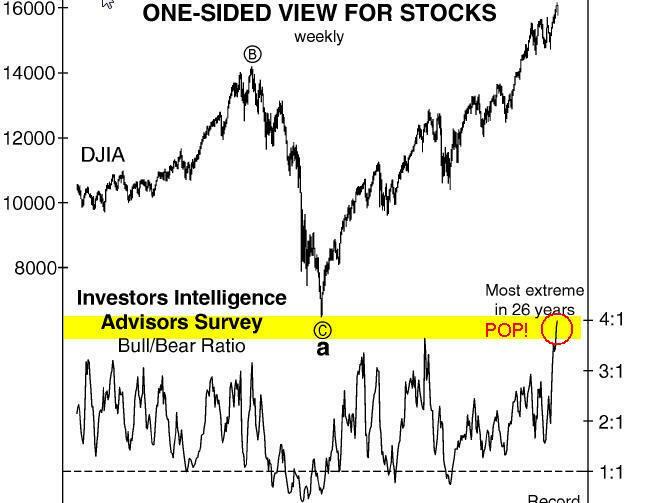 Exhaustion gaps fill this bizzare hyper-manic buying frenzy gone parabolic and that's about to come to an end if it hasn't already with the usual very sad ending for bag holders. Will be fun to watch but don't think it will be tradable. 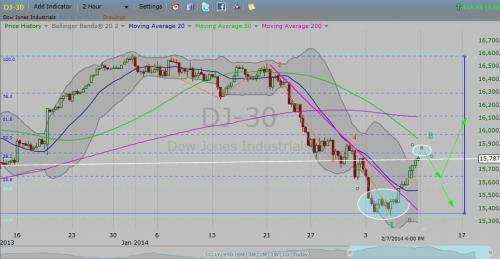 Dow poked first major support level, if things don't hold here next stop 14,900 supportive convergence. Entered BBH short at 96.6. Was watching to get it higher but then as things went south and it took out its opening price, I pulled the trigger, this is not a set up just gonna grab it and set stop at buy price in case this final decline really goes. In the black over 2% off the start. 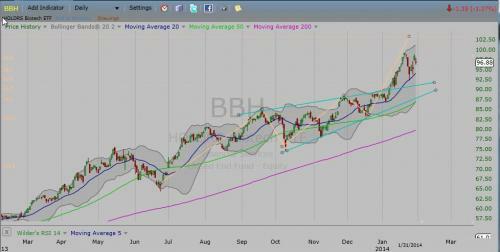 My IBM short also in black 3.4%. GLD at slight gain. Action in gold still quite docile but that is what I expect just hope it won't be too long before it breaks and hopefully to the upside. 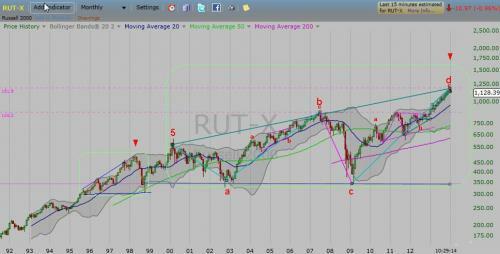 Wave B Exact 50% retracement of Wave A the Financial Crisis panic. There is a massive amount of resistance from 4th wave up (highlighted), the trend mirror effect. Again watching things closely on this broader decline to guage whether one last sizable rally could ensue and take this to the 61.8. I am very doubtful but hoping even in the next few weeks to have a better view when this wave down has shown a good technical bottom. 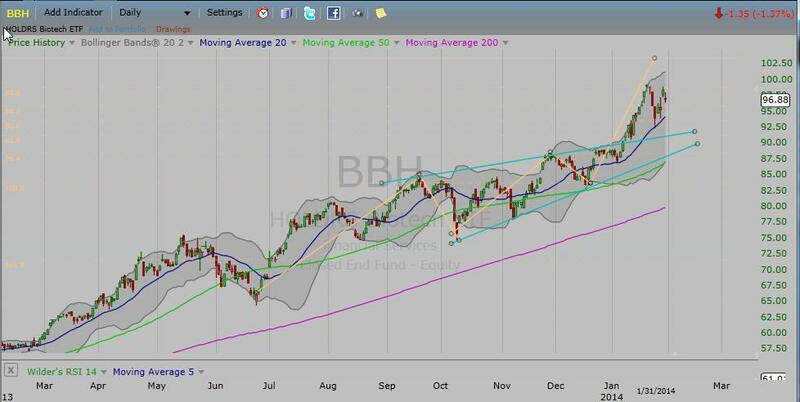 So far BKX has not violated any major support (some minor just broke) or exhibited a reversal pattern but looking at a lot of component stocks sure looks like the top is in! Also this Corrective Wave up shows beautiful 3 wave structure with even its b wave a nice 3 wave down and Wave a = Wave c! Visa V update. 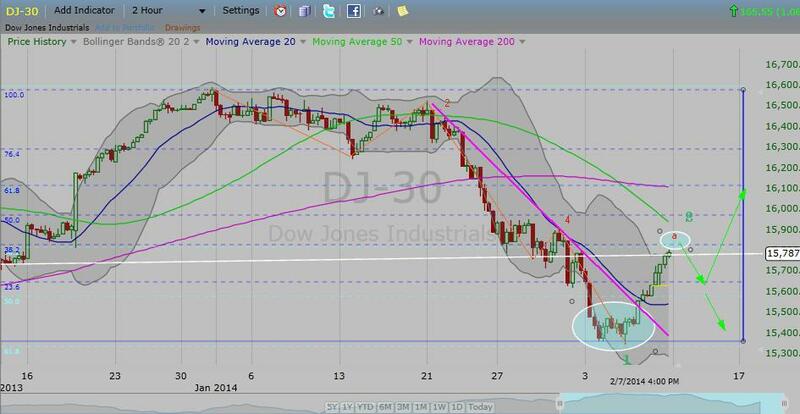 First supportive CV met at triangles projected apex & 50 DMA. Stronger support down under 200 if this gives may present shorting set up to catch the move. Today is a pretty pathetic reaction after that big move down in indices, see what tomorrow brings. So looks like we have may have entered a larger degree corrective phase but I am unable to decipher a wave count, all I see is definite 2 waves down in COMP, and possibly 3 in Dow and SP. 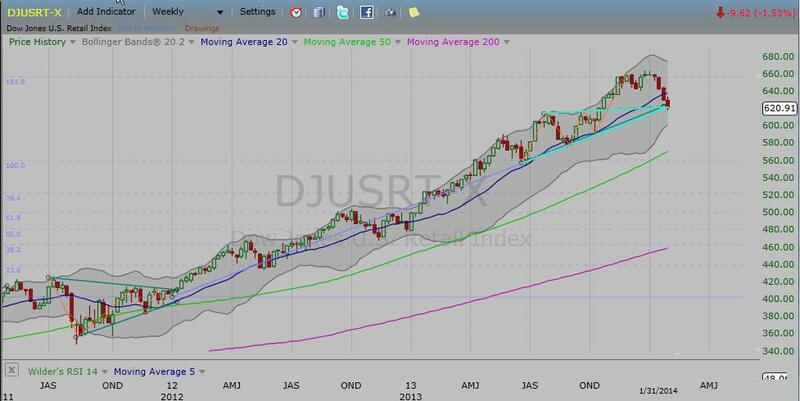 Can't see a proper Wave 1 up there on Dow or SP but often they are irratics. Many other factors don't fit at this point so I just have to sit it out and watch what happens tomorrow and next week before the markets hopefully provide more clarity. Another chart that's make your go hmmmm. Thanks NE! Well seems like I've been waiting a long time to return to my favorite Bearish MB thread. I'll be around quite a while if I am right about this major topping process currently in progress! Interesting week although not a complete surprise, indices hit my first major supportive CV and with the subsequent strong move up. We are now going into larger degree corrective phase that can be a zig-zag, flat, or triangle. I am doubtful of zig zag. Will have good clarity by end of the month. 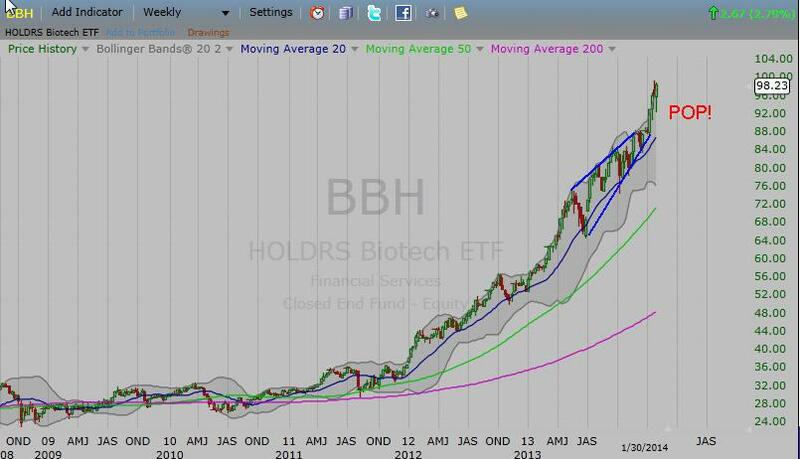 I was stopped out of my BBH short that I grabbed on the run which is usually what happens, was not a bonified set up! GE has been very weak so I am still in money there but may have to dump it. GLD is showing some signs of life I hope this is the start of a nice leg up in gold Trade safe friends. Housing Index, HGX daily and weekly Chart; On weekly bottom chart: Perfect A-B-C all the way up to 62.8% retracement level! Are things in housing market really almost as good as during the 2007 bubble peak??? 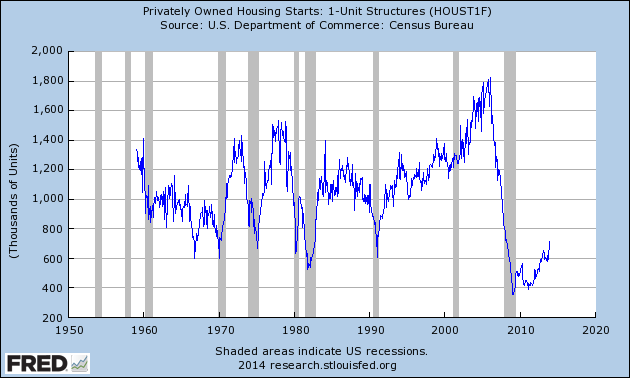 Despite 2013 record year the housing stocks have really just gone in huge messy sideways move. and means top will be in March but whole topping process may extend longer into April-May. On daily wave structure appears 5 wave down and now 3 wave up with very common and textbook structure limiting triangle in B-wave position. Thrust upward exactly equal to Wave a (base) of triangle too! Currently as it fights to go higher one last time, witness the epic battle that has ensued! 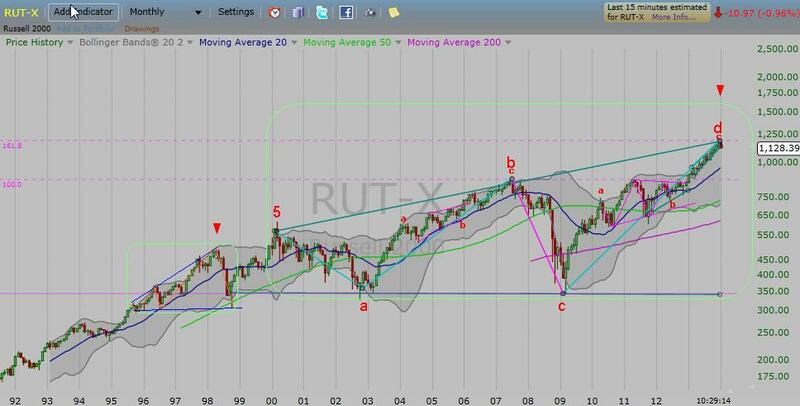 This is quite another beautiful example of textbook Elliott Wave Structure! Almost a complete retracement of entire post 2008 collapse and again near all time highs. Who could possibly be bearish? This is one area I know I hear nor see any bearishness about. After all everyone believes the Saudis can keep their pledge of maintaining $100/ barrel oil, right? The recent spike in prices with this severe winter has even further fueled perpetual optimism of strength. Well I take exception and EW gives me clear evidence its time to go contrarian. The wave structure is a familiar 3 wave up with B wave a magnificent example of an EW 5-wave horizontal triangle of limiting variety frequently found in Wave 4 and Wave B positions. Wave C (thrust out of the triangle) is a very choppy channel upwards that touched exactly the .50 extension of Wave A. This is a very sickly C wave! We have just dropped out of the channel. I am looking for weakness in the energy sector on this broader rally and hoping this comes up to back test the lower channel trendline for a shorting set-up. I also believe crude is in a corrective move up and about to resume larger trend down again.